Posted on Tue, Feb 28, 2012 : 11:45 p.m.
Bedford's Dennis Guss, flanked by Huron's Allen Thomas (left) and Andre Bond in this file photo, was his team's second leading scorer on Tuesday, but fouled out with five minutes remaining. The Southeastern Conference Red Division title was on the line Tuesday night as the Huron High School boys basketball team traveled to Temperance Bedford. Bedford was looking to win its first conference title in more than 60 years, while Huron was looking to repeat. Huron senior Mike Lewis was unaffected by the hostile Bedford crowd as he scored 15 points and grabbed 10 rebounds in a 62-52 Huron win. Lewis spent much of the night battling with 6-foot-7 Bedford forward Jackson Lamb who finished with a game-high 20 points and six rebounds. “Jackson is one of the toughest rebounders we have in our conference, but if you go tough back at him, you’re going to get some rebounds too,” Lewis said. Huron never trailed in the contest jumping out to a 13-4 lead in the first five minutes of play. The River Rats (14-5, 10-2) had already forced nine turnovers and held a 21-11 lead after the first quarter. But Bedford (14-5, 9-3) opened the second with a 9-0 run to cut the Huron lead to one. Coming out of the timeout, Huron’s Kendall Thomas hit a 3-pointer at the 3:37 mark and the River Rats would go on an 11-6 run and took a 32-26 lead into the half. “We were sloppy and they had a lot to do with that,” said Samaha. That sloppy play continued into the third where Andre Bond picked up two offensive fouls and was forced to sit with 1:36 left in the quarter with four fouls. Huron as a team had six fouls in the quarter, nearly putting Bedford in the bonus. Bond finished with 13 points. 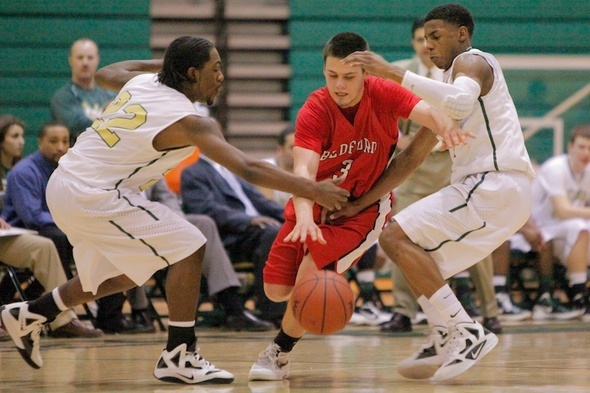 Bedford was dealing with foul trouble of its own as Dennis Guss picked up his fourth foul in the quarter as well. Guss had 11 points on the night including three 3-pointers, but spent plenty of time on the bench with foul trouble. He would foul out with just over five minutes left in the game. Guss leaving the game limited Bedford's options on the offensive end. After Bedford cut the lead to 49-44 in the fourth quarter, Allen Thomas hit a shot from beyond the arc pushing the lead back to eight. Bedford got a layup to respond, but on the next Huron possession, Thomas hit another 3-pointer to make it 55-46. “I was just stepping in, concentrating and making the shot,” said Thomas, who finished with 10 points. The win sets up Huron for a rematch with Ypsilanti in a matchup of SEC divisional champions. Even with the playoffs right around the corner, Samaha doesn’t plan on resting his guys against the Phoenix, who beat Huron 66-57 on Dec. 16. “We play to win, we won’t hold anything back, and they won’t hold anything back either,” Samaha said. Ypsilanti is the only team to beat Huron on its home court this season, something Bond and his teammates haven't forgotten.